After the Vrindavan Municipal Board completes its term of five year the municipal governance comes in the hands of the District administration of Mathura. The District Magistrate Shri N.G. Ravikumar appoints Deputy Collector Smt. 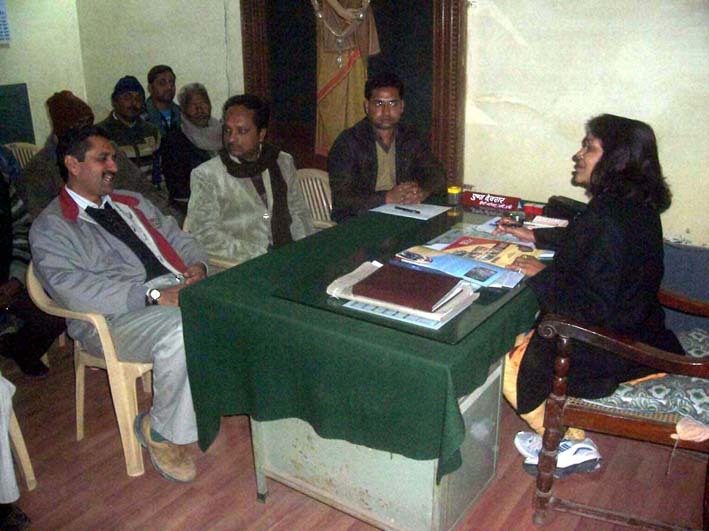 Pushpa Devrar, as the administrator of the municipality having both the powers of the Chairperson and the Executive Officer of the Vrindavan municipality. Recently, Mr. S.K. Sharma, the Executive Officer of the municipality has also been retired. Therefore Mrs. Devrar has to carry both the responsibilities, before any new person gets appointed on this post. On Thursday, she had a meeting with the municipal Sanitation Supervisors and representatives from the leading voluntary organisations of Vrindavan which have been assisting the municipality on the sanitation services. Although it was the introductory meeting with the NGO’s and the municipal sanitation department officials, she made it clear that she wanted improvement in the garbage situation of Vrindavan. She warned the municipal supervisors that if she doesn’t find any change in specified areas of their operation then she may have to take the punishable measures, to make them work. But she preferred rewarding the good workers. She was thankful to the NGO’s for their assistance to maintain the cleanliness of the town. She said that when people come to Vrindavan for the first time they have the view that Vrindavan is very clean for its association with the pastime of Lord Krishna. But after coming to Vrindavan their faith gets hurt finding it dirty. It is the duty of both the municipality and the civil society of the town to make efforts so that people take back good impression of the town. She said that she would soon organise a meeting with the traders, and urge them to cooperate with the municipality. Jagannath Poddar, representing FoV said that there are many reasons behind Vrindavan remains filthy. He pointed out that some technical improvement can bring a vast change within a month’s time. The garbage issue is related with many other issues such as open drainage, traffic and stray animals. He suggested, allocating the satellite collection points in each wards should be the first step to bring the reform. He criticized that the State Governments’ Samagra Vikas Yojna has turned into Samagra Vinash Yojna. The big drains dug up in the small lanes have worsened the situation. He felt that it is the golden opportunity for Vrindavan to get the things implemented under the municipal capacities for having a district official having both the powers of an Executive Officer and administrator. She has very short time before the next municipal election to bring the reforms in the sanitation system of the town. The examples set by her can be followed by the new board.